Elks at Christian County, Mo., Lodge No. 2777 helped local students start the school year off right. 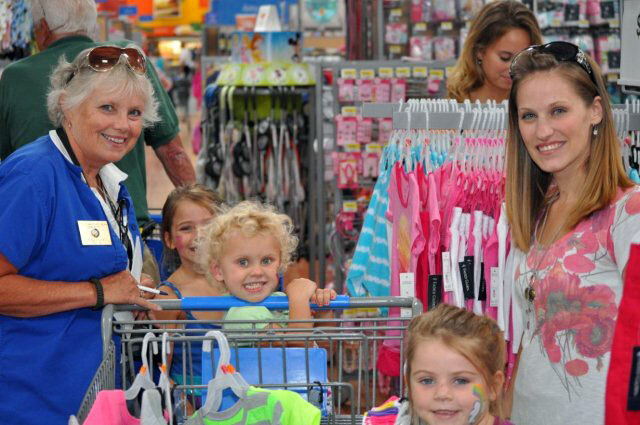 The Lodge combined its Promise and Beacon grants to take 80 students in need on a back-to-school shopping spree. Elks helped each student pick out necessities ranging from shoes to coats. Through this project, the Lodge attracted more than $5,000 in additional community support. “We want children to be comfortable and confident when they return to school,” says Project Manager Tom Shelton. The Elks National Foundation will help Lodges meet local needs by investing up to $6.5 million this year in Elks communities through Beacon, Gratitude, Promise and Impact Grants. These grants offer Lodges an opportunity to serve the community in ways that will raise the Lodge’s profile, energize the membership, encourage former members to return to the fold, and gain the notice of people who want to be part of an organization that’s doing great things. To learn more about the Community Investments Program, visit www.elks.org/enf/community. The Elks and Auxiliary had a wonderful time shopping. I think we had more enjoyment than the kids and their parents. Our ENF Chairman, Tony Leciejewski and other Elks did a super job getting the community involved. It will be bigger next year. Thank you, ENF, for the grants to be able to perform this great service for our community.